My wish has finally come true! After years of being "offline" whenever I go to my favorite SM mall (SM Bicutan), SM together with Philcom has finallyinstalled wifi at SM Bicutan. The launch was on August 21, 2009. Hooray!!! Building B Lower Ground - good especially at the middle, you can surf while having your hair done at Going Straight! Thank you SM for this early birthday gift! I just hope though that next time there won't be a noisy! noisy! band (they were good though) since it gave me a very bad headache. 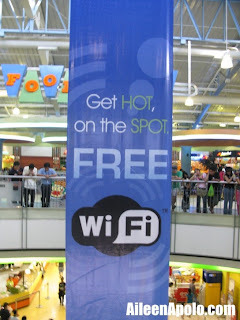 SM Southmall and Bacoor has free wifi also.. I've even tried surfing in MOA up to 2am and it's still on..talk about overtime..
SM Santa Rosa meron na rin Free WiFi.. Yahoo!! !